Review of Tieton Bourbon Peach. I tried this on draft 2 years ago (see here), and heard last year that it came out in bottles but never saw it. Now that I found it this year, I wanted to do a full review. I’ve also had their Cidermaker’s Reserve, Apricot, Smoked Pumpkin, Wind (Pommeau), Wild Washington, Cherry, Blossom Nectar, Sparkling Perry, Cranberry, Frost (ice cider), Spice Route, Russian Red, and Lavender Honey. Cider Description: Juice from hand-picked Washington State peaches is married with the richness of Kentucky bourbon barrels. This creates the perfect balance of sweet, ripe peaches and tartness of green apples. The charred oak of bourbon barrels gives this cider a deep vanilla and plum character. A touch of oak tannin finishes this cider off perfectly. Our love of what Northwest farmers have to offer has led us to create this “Limited Release” program. Featuring the bounty of our local agriculture, Tieton Cider Works’ Limited Releases will focus on some of the very best products the Northwest has to offer. Bourbon Peach is the perfect summertime libation with a refreshing blend of juicy peaches with and aged bourbon barrel flavors. Cidery Description: From branch to bottle, Tieton Cider Works controls every aspect of the growing and cidermaking process. Tieton Cider Works boasts the largest orchard of cider varieties in Washington state and the largest Perry pear orchard in the United States. We blend our gnarly, inedible cider fruit with our organically grown dessert fruit. We’ve been growing apples, apricots, cherries and pears on Harmony Orchards – our family farm – since the 1930’s and are thrilled to be involved in Re:interpreting the tradition of cider making. First Impression: Medium straw yellow hue. Low carbonation. Smells mild, of peach. Tasting Notes: Semi-sweet to semi-dry. Medium bodied. Low tartness. Moderate acidity. Hints of tannins. No bitterness, sourness, or funk. Notes of peach with some other fruit (pineapple, mango, pear) and oak. Moderate length finish with mild bourbon. Moderate sessionability. Low apple flavor, barrel influence, and bourbon influence. Moderate complexity and flavor intensity. My Opinion: Awesome! I love the flavor profile, and it has a nice complexity for being made from dessert apples. This is exactly the type of cider that I go for when drinking non-cider-apple ciders – full flavored and semi-sweet to semi-dry. If anything though I would have liked more bourbon. I’m really glad they went a bit sweeter on this, as I think many barrel aged ciders often go too dry, which combined with the barrel & spirit influence can come across as harsh. Most Similar to: I’ve had a number of peach ciders, such as Black Fin Pacific Peach, Red Branch Peach, Schilling Road Trip (Peach Citra), Sancho Libre Peach Sangria, Fox Tail Fuzzy Haven, and Mission Trail Peach Coast (100% peach, so fruit wine not cider). This reminds me most of the Schilling Road Trip, except it has bourbon instead of hops. Most of the others were drier and more tart. Closing Notes: The price point on this is great too, for what you are getting (I checked Total Wine’s website and found out they just got it in stock, and sell it $1 cheaper, for $6.99). I think this would do well in cans, but I think Tieton only does that for their ‘Rambling Route’ line (which I’m not a huge fan of, although its plenty drinkable). Have you tried Tieton Bourbon Peach? What did you think? Review of Tieton’s Lavender Honey. It is my first time trying it, but I’ve had most of their ciders – Cidermaker’s Reserve, Sparkling Perry, Cranberry, Bourbon Peach, Frost (ice cider), Spice Route, Russian Red, Apricot, Smoked Pumpkin, Wind (Pommeau), Wild Washington, Cherry, and Blossom Nectar. How Found: Browsing. I had heard it was available on draft but hadn’t had the chance to try it. First Impression: Light straw yellow hue. Very low carbonation. Smells of honey with a hint of herbs. Tasting Notes: Semi-sweet to semi-dry. Light to medium bodied. Low to moderate tartness and acidity. No bitterness, sourness, tannins, or funk. Notes of light tart apple and lavender which quickly dissipate, then the fuller bodied sweet honey with a hint of pear. Moderate length finish. Low apple flavor. Moderate flavor intensity and sessionability. Low to moderate complexity. My Opinion: I liked it. There were two distinct stages of this cider when tasting, which was pretty unique, but they also seemed to compete a bit with each other. Most Similar to: I’ve actually had 5 ciders with lavender (Elemental Pom-Lavender, Elemental Lavender Rose Petal, Greenwood Lavender Blackberry, Seattle Cider Lavender Lemon, and Finnriver Lavender Black Currant), but none also had honey, which is fairly commonly added to cider (it even has a name when they are co-fermented, cyser). My favorite cider with lavender is Finnriver Lavender Black Currant, especially when on Nitro tap. Some of my favorite ciders with honey are Finnriver Honey Meadow, Long Drop Vanilla Honey, and Moonlight Meadery How Do You Like Them Apples. Closing Notes: This was released last year too, but somehow I missed it (probably as I think it was draft-only last year). My favorite Tieton cider remains Bourbon Peach, which I’ve only seen on draft, as their summer seasonal, but hopefully they do bottles this summer. Have you tried Tieton Lavender Honey? What did you think? Review of Tieton’s Spice Route. It is my first time trying it, but I’ve had most of their ciders: Cidermaker’s Reserve, Sparkling Perry, Cranberry, Bourbon Peach, Frost (ice cider), Apricot, Smoked Pumpkin, Wind (Pommeau), Wild Washington, Cherry, and Blossom Nectar. Availability: Year round, since July 2015. Tieton ciders are available in WA, OR, AK, HI, B.C., ID, CA, NV, MT, WY, UT, CO, AZ, NM, TX, FL, MI, IL, and OH (per their website). They also take orders by phone to be shipped in WA (info here) and have a tasting room (info here). Cider Description: An exotic and fresh cider. Expect a medium straw with hints of cinnamon, vanilla, clove and allspice. Reminiscent of a fresh baked apple pie. How Found: Browsing. Its one of the few ciders from them I hadn’t tried. First Impression: Dark straw yellow hue. Very low carbonation. Smells of hints of spices and vanilla. Tasting Notes: Semi-dry to semi-sweet. Light bodied. Low to moderate tartness. Moderate acidity. Hints of bitterness and tannins. No sourness or funk. Notes of cinnamon, allspice, clove, vanilla, oak, grapefruit, and honey. Moderate to long spiced finish. Low to moderate apple flavor. Low flavor intensity. Moderate complexity. Moderate to high sessionability. My Opinion: I’m usually not a fan of spiced cider, but I really enjoyed this one. It wasn’t overly spiced or sweet. The complexity (especially the vanilla and oak notes) was nice too. Closing Notes: This is one of my favorites from Tieton. My absolute favorite was Bourbon Peach, which was a tap-only special release. Have you tried Tieton Spice Route? What did you think? Review of Frost ice cider from Tieton Cider Works. I’ve tried several ice ciders before (see here), and have tried most of Tieton’s lineup (see here). Availability: AZ, CA, CO, FL, HI, ID, IL, MI, MT, NM, NJ, OH, OR, TX, UT, WA, WY, and B.C. Canada. Also, online sales to OR and WA. Cider Description: Our autumn harvest blend of Jonagold, Pinova and Winter Banana apples produces a pale straw cider that is expressive and floral with a pleasing sweetness. Enjoy this cider at room temperature as an aperitif, as a cocktail base or the perfect finish to any meal. Our friends at Simple and Crisp asked Sharon to come up with a recipe for their product. Apple Crisps from Simple and Crisp topped with Tieton Farm & Creamery Bianca cheese and drizzled with honey. This recipe works as an appetizer or a dessert, which is why we love it. Cidery Description: We are continually asked: how did you get into the cider business? The answer is easy: we were in the apple growing business. Period. If we had not been a farming family, cider would not have held an interest. A love of land, food and drink has inspired us to make cider with the fruit we are growing at our ranch, Harmony Orchards. We know the ciders we make are an expression of the harvest and reflective of the fruit and the place that it is grown. We are thrilled to be involved in re:interpreting the tradition of cider making. How Found: Browsing. I love ice cider, and hadn’t tried this one. First Impression: Dark straw yellow / light amber hue. Completely still (no carbonation). Smells rather mild for ice cider, of sweet apple juice, honey, and apricots. My Opinion: I enjoyed this, but I like Eden’s ice ciders much better, with their greater complexity (especially their barrel aged Northern Spy). For $5 extra per bottle I think its worth it. Most Similar to: This is quite different from the other ice ciders I’ve tried, as it isn’t as full bodied, sweet, or complex. Also, it was more fruity than rich (most other ice ciders I’ve tried had notes of caramel, brown sugar, and vanilla). Its probably closest to Pomme De Coeur ice cider. Closing Notes: I’m glad I got a chance to try this. I think it is a nice summery ice cider, as it wasn’t as rich or complex, and was lighter bodied and fruity. Have you tried Tieton Frost? What did you think? Tasting notes from my eighteenth visit to the Schilling Cider House in the Fremont neighborhood of Seattle WA. Check out my past posts with tasting notes here. I was there last Thursday, for the One Tree Crisp Apple cider release party, and enjoyed a flight of four ciders, plus One Tree’s new cider. Portland Cider Company (Portland OR) Pineapple (5.7% ABV): This draft-only pineapple cider poured foamy but settled down after awhile. This may be their “Maui Cruiser” variety, which also has coconut blossom nectar, as I couldn’t find any evidence that they have a strictly Pineapple cider. Smells of fresh pineapples. Semi-dry. Light bodied. Low to moderate tartness. Low acidity. The flavor is purely pineapple, with low flavor intensity. I felt this cider smelled much better than it tasted…it left me wanting more flavor. The pineapple aroma was so strong (especially in comparison to the cider’s flavor) that it makes me curious if it was added. Wandering Aengus (Salem OR) Barrel Aged Wickson (8.0% ABV): This is a barrel aged draft-only version of their single varietal Wickson crab apple cider, which is available in bottles (which I tried previously and found overly harsh). Smells mild, with hints of crab apples and oak. Dry. Low flavor intensity. The barrel aging seemed to mellow the cider’s intensity compared to the original version. Light bodied. Moderate tartness and acidity. Low bitterness and tannins. Alcohol-forward with crab apple sharpness, oak, and honey notes. This is best drank cold as it becomes more harsh as it warms up. I found this more drinkable than the original version, but I still didn’t care for it. Tieton (Yakima WA) Bourbon Peach (6.5% ABV): A draft-only bourbon barrel aged peach cider. Hazy lemonade hue. Smells of bourbon, peaches, and pineapple. Semi-sweet to semi-dry. Hints of boozy bourbon (but not overpowering) and peach & pineapple notes. Yum! Medium bodied. Moderate tartness and acidity. Moderate flavor intensity. Low apple flavor. Medium to high sessionability. I’m a fan of bourbon barrel aged ciders, but often they tend towards being overly boozy, harsh, dry, etc…this one was tasty and easy to drink. Locust (Woodinville WA) Sweet Aged Apple (6.9% ABV): This is a barrel aged cider made from dessert apple varieties which is available on draft and in bottles. I’ve tried this previously (when it was called Aged Washington Dessert Apple; see here), but had heard they significantly changed the recipe, so I wanted to give it another try. Last time it was quite hazy and unfiltered looking, but this time there was no haziness. Smells mild and apple-forward. Semi-sweet (less sweet than the previous recipe). Less flavorful than the previous recipe, but much more sessionable. Mild tartness and acidity. Caramel, vanilla, and honey notes. Medium bodied. Moderate to high apple flavor. Moderate flavor intensity. I’m not sure which recipe I preferred, as there are pros & cons of each, but I enjoyed both versions. One Tree Hard Cider (Spokane WA) Crisp Apple (6.8% ABV): This is their new flagship cider, sold in four packs of 16oz cans and on draft. Hazy. Semi-sweet to semi-dry. Medium bodied. Unfiltered baked apple flavor with honey notes. Moderate tartness and acidity. High sessionability. Strong apple flavor. I enjoyed this. I found it very similar to 2 Towns Out Cider, but slightly sweeter and slightly more flavorful. Much less sweet than any of the other ciders I’ve tried from them. The Tieton Bourbon Peach cider was my favorite, and my favorite cider from Tieton so far. Review of Rambling Route Yakima Cider, made by Tieton Cider Works. This is their lower end canned cider (vs. their bottled ciders). Cider Description: The apple’s journey to America was parallel to man’s. The boat landed and the exploration began: in this vast new land the choices for thriving were endless. Some were happy to live on the coast where they landed, spreading out and staying diverse. Others were content to live amongst a few or be a solo tree in a town square. A few made it halfway across the land and settled in. The fearless joined the westward migration on horses and wagons, traveling thousands of miles looking for the perfect dirt, long sunny days and ample water. When it reached the land that would be called Washington, the apple knew. It was home at the end of a Rambling Route. For those that appreciate the bold, crisp flavor of biting into a Washington grown apple, your quest for the perfect apple cider ends with Rambling Route. We grow and press only fresh apples from our family farm and carefully blend under the roof of our own cidery located in the heart of the Yakima Valley. Expect pineapple aromas and mineral qualities on the nose, snappy and racy acid levels on the palate, coupled by a deep full-bodied finish. No additives, no concentrates, or preservatives – ever! Additional Info from Rambling Route: We use a variety of bitter sharp and bitter sweets apples in our Ciders. Along with some dessert varietals. We launched our can division on April 1st which is the Rambling Route brand. We will be launching Rambling Route in early 2016 with kegs. How Found: Browsing. Since then, I’ve seen it promoted quite a bit. First Impression: Mild dry acidic crisp apple scent. Little carbonation upon pouring, but tiny bubbles. Light straw gold hue. Opinion: On the drier side of semi-dry. Moderate to high acidity. Mild tartness, bitterness, and astringency. Citrus notes. I noticed the slightest bit of tannic cider apple taste, but it left me wanting more. Rather bland and watered down tasting. Light bodied. Longer finish with an odd almost soapy aftertaste (which I read can be a sign of stressed yeast). I liked that it wasn’t too bitter, which I’ve often found with drier ciders. I don’t agree with their description that it is bold or full-bodied. It is however a crisp and easy drinking cider. Well balanced, but I found it boring and unimpressive. Most Similar to: Other drier light bodied PNW flagship ciders such as HUB Hard Cider, Red Tank Happy Cider, 2 Towns Bright Cider, Seattle Cider Semi-Sweet, and Anthem Cider. Closing Notes: I commend Tieton for making an affordable craft cider (relatively small batch, made from fresh pressed juice, nothing artificial added, etc), and one that isn’t too sweet either. However, it just isn’t to my liking. I think if it was higher carbonation and had a richer flavor, they would be on to something I’d enjoy. I’m still in search for an everyday drinking craft cider which is affordable (which usually means it comes in a multi-pack). The cider folks I’ve talked to seem to either love or hate this cider. I’m sorta ambivalent. 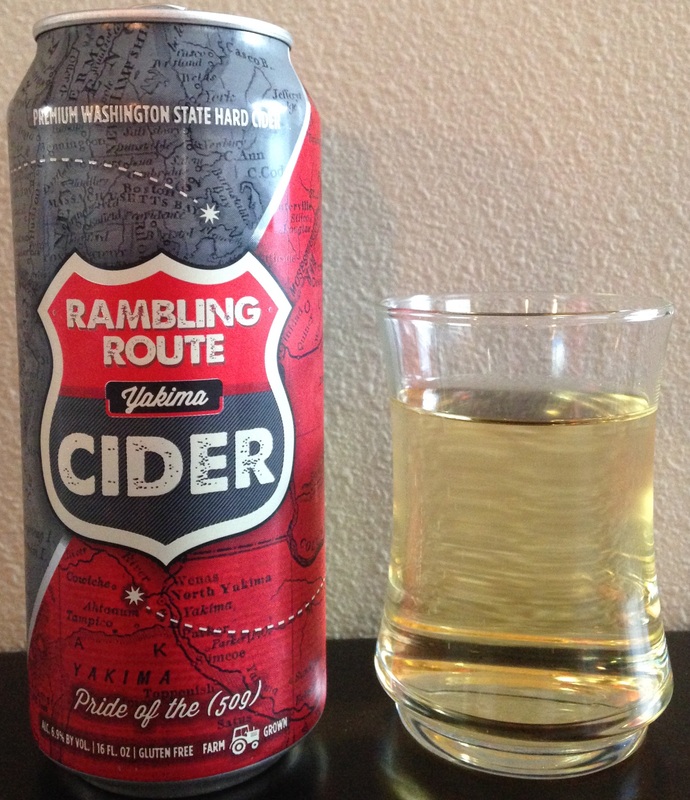 Have you tried Rambling Route Yakima Cider? What did you think?